Society has long been associating blockchain with bitcoin. Although Bitcoin was indeed the first product of its kind, the possibilities of this technology are found far beyond cryptocurrency production. Today, blockchain has become key to advertising transparency and decentralization. The late decade of the twentieth century signified the birth of a brand-new, quick spreading, and hard to track the type of crime – advertising fraud. In digital and programmatic advertising, fraudsters found the perfect getaway to enormous bot-induced incomes. Click-fraud installs hijacking, and other illegal online activities bring 2500-4100% ROI to fraudsters, which translates to only 56 cents that brands receive from each dollar they have spent on media-buying. The discovery of the Methbot botnet in 2016 revealed a monstrous scale of fraud that helped hackers to make $5M per day by faking video views. As a result, ad fraud has been called the most profitable criminal activity in the world and the greatest plague of digital advertising. Purchasing impressions on any website, you can waste more than 50% of the advertising budget, instead of real users, bots will view your ads. 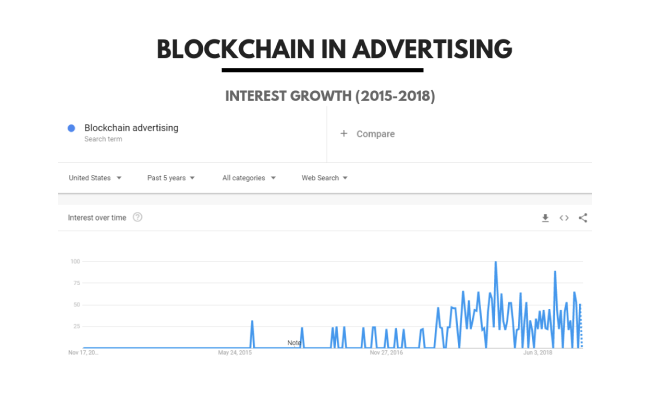 Meanwhile, blockchain in advertising is currently an agenda of the day at all marketing and tech conferences around the world. Since 2016, we have observed an increased interest in the area. For blockchain advertising, it was a time first publications, for experiments, and speculations around the subject. Panelists, speakers, bloggers, and journalists across the world were throwing bold statements about blockchain being a panacea against fraudulent advertising traffic. Is blockchain really a new cure against all advertising problems, or should we take it with a grain of salt? Let’s take a look at the decentralized ledger — can it help the industry that’s already technology-rich? Despite the apparent complexity of the blockchain, delving into the general principles of its work will be enough for a layperson to understand the advantages and possibilities that technology brings to advertising. The blockchain is based on a distributed database where all information is stored on the computers of every network participant simultaneously. 99% of devices can be disabled at the same time which makes it impossible to corrupt. The decentralized ledger consists of blocks attached to each other. These blocks contain information about all transactions and actions which have taken place. An attempt to change one block will destroy the integrity of the chain. That’s why the computers of the other participants automatically reject it. All network participants have a unique identifier and a digital signature. At the same time, the personal data remains confidential (or available in case a particular chain’s requirements state so). What does it give to advertisers? First of all, it is a protection against ad fraud. If a transaction is recorded through blockchain, it’s verified within each node, which practically makes falsification impossible. Such increased transparency also helps media-buyers verify where, how, and when their ads were placed on site. Universal digital identification, which has to do nothing with personal data, will prevent fraud of any type, and protect the user from unsolicited use of their information. If ‘trust issues’ for your B2B business are natural, then blockchain implementation might be just what you need. With the help of the smart contracts, which are basically a set of rules that automate the execution of contract requirements, you take another step forward, strengthening blockchain’s ability to serve as an accurate source of truth. Another pain point is a lack of transparency that digital advertising lacks. When you can’t trust websites, you are forced to work with intermediaries such as Facebook and Google, which act like traffic quality arbitrators. The problem is, intermediaries between the advertisers and publishers take substantial commissions for their services. These services have given the name to a phenomenon called “walled gardens of data” – an environment that can control your access to web services and information. 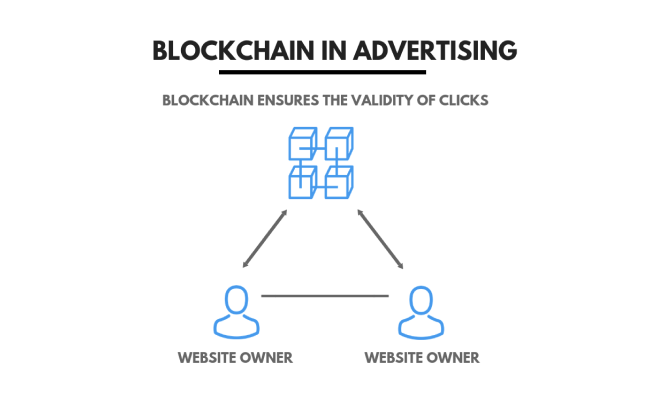 Blockchain advertising removes the need for intermediaries, providing the opportunity for direct control over the ad placements and costs spent on advertising budgets. Advertising services based on blockchain core are actively developing, but we are standing at the very beginning of massive transformations. Highly valuing the opportunities that decentralized ledger provides, such big names like IBM, Unilever, Kellogg’s, and Kimberly-Clark ally in a consortium that promises advertising safety and transparency for participants. As well, the IBM ecosystem provides support to startups who have created blockchain-based applications. They will be able to place their products in the IBM Marketplace store. Software developers can join the IBM ecosystem and freely access tools (including library code, smart contract templates, etc. ), education courses, and more. Another example is the blockchain-driven browser Brave, which was created by the co-founders of Mozilla and Firefox. Instead of collecting personal data by default, it helps users to perform micropayments for the content they watch in Bitcoins and stay anonymous. 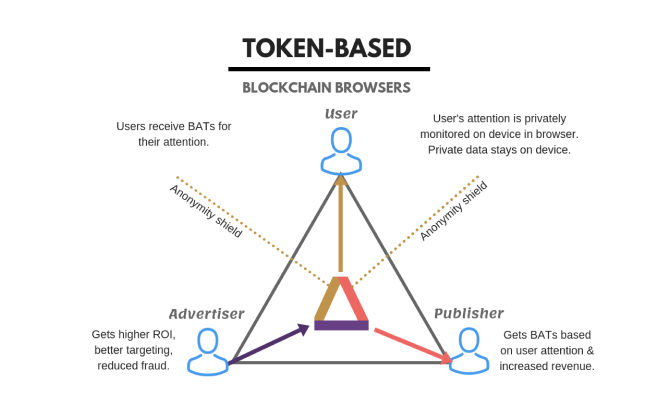 Many blockchain advertising products are also built on Ethereum and so-called utility tokens that function within the system and are issued to participants when the desired action is verified. In such projects, utility tokens guarantee financial operations between supply and demand parties and serve as an incentive for the users who receive tokens for their attention to advertising. There are a few cases that illustrate the practical advantages of using blockchain technology. Some of them we’ve mentioned, but the rest of them still exist at the level of ideas and pilot projects. 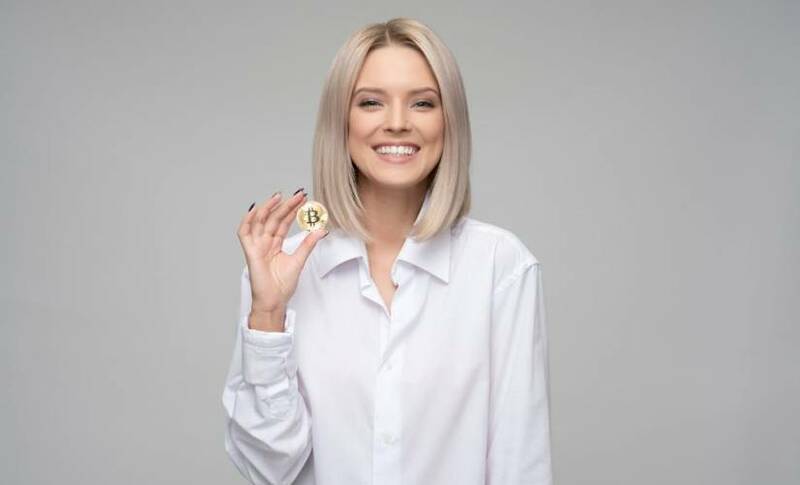 For the most part, marketers and advertisers are still poorly aware of the principles of blockchain technology and implementation. Because marketers and advertiser know so little about blockchain technology and implementation — this fact stays as the number one reason why markets hesitate with mass technology adoption. Blockchain has not been embraced by the industry as a standard yet. The functioning of nodes depends on the number of network participants; in other words, the infrastructure is what supports the operation. If there are few participants in the network, it will not be quick and efficient. That’s what IBM’s senior vice president of industrial platforms, Bridget Van Kralingen also mentions. The future development of blockchain will depend on a stable ecosystem. Corporate networks will be able to reach a robust capacity only when innovative technology developers, industry experts, and infrastructure providers unite to prepare the market for a broad blockchain implementation. Blockchain holds great potential for digital advertising since it solves fundamental issues of trust, eliminates ad fraud, and makes advertiser-publisher relationships more transparent. We are standing on a threshold of mass introduction of blockchain-based ad solutions into real businesses. When market participants combine their efforts and finally build a robust infrastructure, we’ll witness the emergence of solutions that satisfy the needs of all market participants.